I made this recipe too! This is delicious. Thanks again! I love your blog! Mitra, thank you for stopping by and letting me know. I'm glad you liked it. One stalk of celery to me means one stem. The whole 'bunch' I am used to calling a 'head of celery'. That's the plant as you cut it out of the field. Judging by the photo, you need a lot of stalks, probably one head to make this dish. yes, you need a head of celery for this dish. thank you! I have this simmering on the stove now - can't wait to dig in! Azita, I need to say that I LOVE your blog!! I try to cook something from here, often as my husband is Persian. Keep up the good work!!! Kerry, Noush-e jan! Thank you so much for stopping by and commenting. I'm so glad that you find this blog useful! I made this recipe and it was yummy. I am the worst cook on the planet so your recipe must be great..
Anonymous,thank you and I'm so glad you enjoyed it. Thanks so much for visiting and commenting. 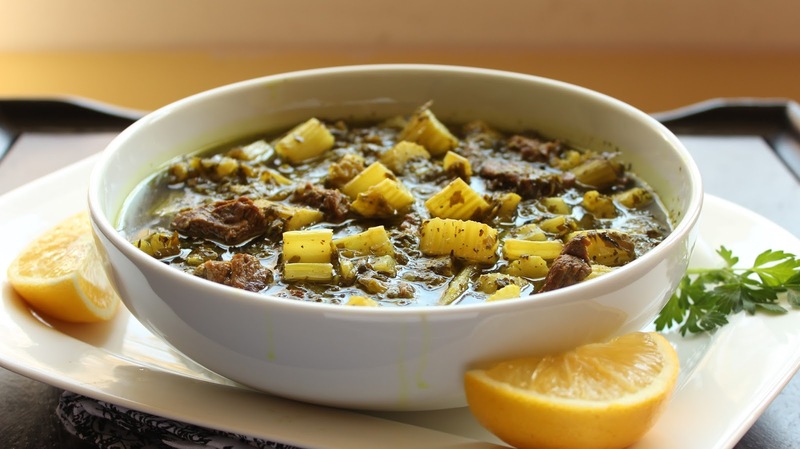 I am trying this recipe tonight... Karafs is one of my FAVORITE Persian dishes. SO EXCITED! Hi Jilah, still to this day, the hot and cold properties of food is very much observed in Iranian cooking and our daily food consumption. Onion is always used in making a khoresh and we usually start the stew by frying the onion. However, the use of garlic depends on the type of recipe and the region. For instance, I use it when I make a khoresh with eggplant, okra, celery, shrimp or fish, just to name a few. Thank you very much for your kind words. I am still discovering your wonderful blog and food. This time I did the celery stew. It was very tasty, however, as I did it with beef, the meat turned out a bit dry. After so long cooking time it was soft but not juicy anymore. Azita, if you prepare it from beef, what part of beef do you usually use? Maybe mine was too lean? Hi Wioletta, I usually get boneless beef chuck for this stew and trim the excess fat. Today, I made khoresht bademjan with your recipe, for the first time, and for my wife and my family. I was trying to see if I am any good in cooking a real Persian dish. It came out great and everyone praised it. Thank you very much for such good recipes and keeping this blog. It is a great service to Persian cooking. Thank you Soheil jan for your kind comment and I am so glad your family enjoyed the recipe. I just made it today! Great recipe!!! Came out delicious!! thank you for a great website! 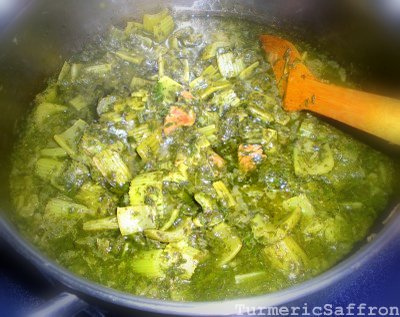 My name is Fariba and I would love to find a great Aub Gousht Recipe. I haven't had it for maybe 20 years, but my dentist mentioned it yesterday and I been craving it since. If you have one, I would love to try it. Thanks very much! By the way, I too am enjoying your blog and got on hear to find out more about Khorushte Karfse ingredients. Thanks again!! Would this taste good with chicken? I am on a diet and cannot eat red meat or lamb. I would like to try this, but if it won't really work with chicken, I can just make another dish (any low calorie Persian recipe suggestions?). Yes, this recipe tastes delicious with chicken too. I made a tiny modification and it doesn't make any difference in taste. I use rhubarb instead of lemon juice. Same magic! I wouldn't recommend rhubarb since it has slight toxicity and is rather sour. Just my opinion though. Hi Azita, I'm so glad I found your blog, it's just wonderful! My fiance is Persian and is longing for some stews that have red meat in them. He was eating this particular one today but with chicken instead since his mother is more into chicken these days. So I'm excited to try this and make him some food he craves from his childhood. Thanks for the inspriation! Made this last night! First time making Khoresht Karafs, it turned out fantastic. I added a little bit more Turmeric than listed on the recipe. Thank you for the easy to follow directions! I’ve been using your recipes for the last year. It has completely changed my way of cooking. My dad is Persian and I have a Filipino mom who cooks excellent Persian food and I always wanted to be like her. Thanks to you, she’s now the one asking me for recipes! Lol. I’m cooking things now that I never thought I possible could. like Tahchin, khoreshteh bademjan and I just tried Ashe reshteh today and it was a hit!!! Thank you for all you do. making this for a second time in as few weeks! I had made a huge error the first time and bought mince lamb by mistake but went ahead anyway. It was delicious as far as the flavour went. just got home with chunks of lamb this time and cooking for a bunch of family tonight. I can't wait and also couldn't wait any longer without saying a huge thank you so THANK YOU!! Last night some friends came over from another village to cook this dish in my large dutch oven. We are from the high mountains of central Lebanon and are used, to and appreciative of, the flavors and ingredients commonly used in near eastern/middle eastern and further east eastern, but not so much 'oriental'/far eastern, cuisine. We are all proficient cooks, home cooking style, and in general use recipes as the inspiration and general prep direction of the tabkha/meal. Our palates are heavy so we usually augment quantities of onion, garlic, parsley and etc to make the tabkha more rich/stronger within somewhat balanced limits. From my experience, and in general across the rest of the communities in Lebanon, I can claim that we don't have a lot of experience with, or exposure to, Iranian cuisine and Iranian concoctions and combinations of ingredients. 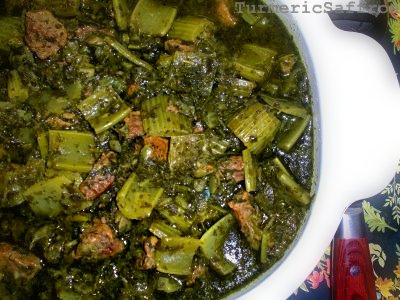 To my knowledge fresh mint in any quantity is never used in any STEW/yakhni type dish that is commonly cooked in this country or in this greater area...Leb/Syr/Pal. Celery is also not commonly used in the Lebanese kitchen and until recent times was not commonly available as a staple in local green grocers and town shops and etc. If celery is used it is used in limited flavoring quantity as European and North Americans use it in their various stews and soups. Sooo...when the boys told me they were coming over to cook this awesome dish I was somewhat skeptical of how a very large quantity of chopped celery, mint, parsley and small cubed lamb shank would combine and end up tasting. I could not figure or imagine how it would taste. So for myself that first spoon that I shoveled into my mouth was an exciting and novel experience. Wow indeed. Absolutely delicious...flavorful, warm but at the same time'fresh'...in short unbelievable. We ate the stew over saffron rice prepared with fresh chicken stock. We also have the habit of frying/sauteing the ingredients one by one in a large skillet and then combining them for the low simmer in the dutch oven. 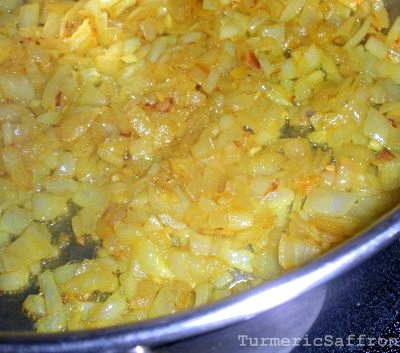 Today I looked up this dish online and came across your blog and sent your link to one of the guys with the following comment...''blog site turmeric and saffron....definitely some good ideas here''. I am sure I/we will be thanking you for inspiration in the future. Have a nice day.